Since opening the doors in 1980, Brennan & Clark has been a pioneer in the collection industry. Our philosophy is simple: How can it be done better? How can we provide better service to our clients? How can we enhance our team through training and development? At Brennan & Clark, we do not try to fit our clients into how we do business; we strive to work as an extension of our customer's business. Approaching each client with a completely customized approach to partnering with them, allows the flexibility necessary to accommodate their needs. This is possible because of the team that we have assembled. We have the best team of negotiators in the industry working to advocate our clients rights. Having the best team is the cornerstone to our ability to provide an unparalleled level of service to our clients. Our organization has been in the forefront of the collection arena for decades constantly elevating our industry. This ranges from offering a variety of non-traditional services to most recently being a founding member of the CCA of A. The B&C team is only satisfied when we go beyond collections, providing customized receivable support solutions that eliminate credit losses. Website accounts are reserved for Commercial Collection Agencies of America members. To learn more, click on "Join" in the menu above. 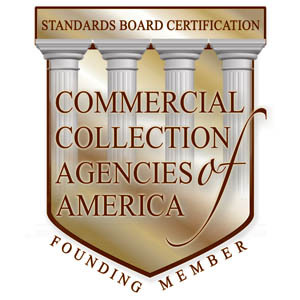 Commercial Collection Agencies of America, Inc.